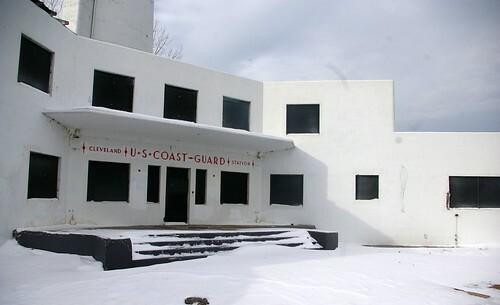 Completed in August, 1940, the Cleveland Coast Guard station, designed by architect J. Milton Dyer, was considered at the time the "most beautiful in the nation". Dyer, a Clevelander, is known for the Brown-Hoist Building, the Cleveland Athletic Club, Cleveland City Hall, First Methodist Church (E. 30 and Euclid), the Peerless Motor Car Company (later the Carling Brewery), the Tavern Club, and this building. 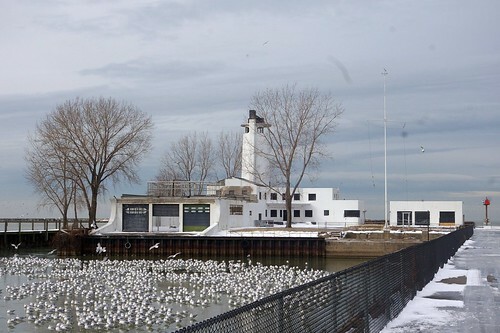 The complex, a significant piece of Cleveland architectural history, was built on fill just off the end of Whiskey Island, at a cost of $360,000 ($5.5 million in 2009 dollars). 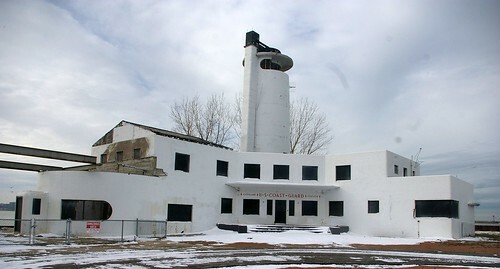 The main building contained quarters for officers, crew, and staff, a communications room, recreation room, mess hall, and storage. The boat house has slips for three vessels and space to work on them. A three car garage is also part of the complex. 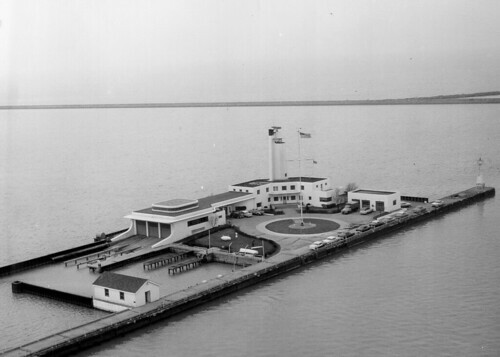 The Coast Guard Station is located on Whiskey Island, at the end of a long pier. 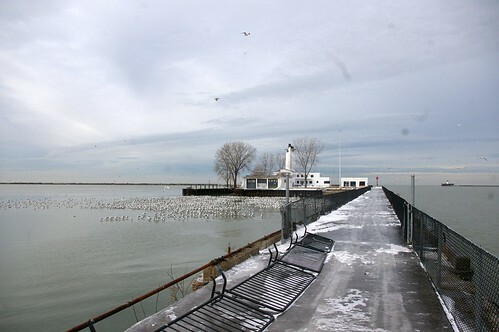 Much of this part of Whiskey Island is now a public park. It's is an area of incredible beauty, surprisingly close to much of Cleveland. It took me about 15 minutes to drive to it from my University Circle area library. Even in the current condition, it is an attractive group of buildings. The main building was boarded up recently. Before that time, Illicit Ohio captured an excellent set of photographs documenting the condition of the buildings. One visual element of note is the staircase to the second floor, which continues the "streamlined" elements present in the rest of the building. The roof between the boat house and main building, visible in the historic photograph above, was removed this fall. It is set to be replaced in the spring. I hope these plans also include the replacement of the roof on the main building, which, as seen in Illicit Ohio's photographs, is on the verge of collapse. All of the buildings originally had steel casement windows like those seen here on the boat house, some square and some which curved with the wall. In the present condition, their repair would be difficult at best. 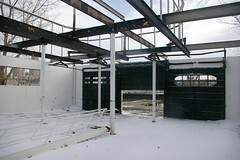 The steel structural elements were likely installed when the roof was removed, to help stabilize the structure. 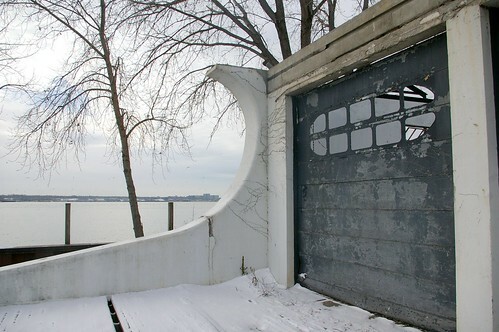 This garage-type door, probably made of galvanized steel, is original to the boat house. When it was built, there were five such doors. It appears that four remain. They made it possible to easily haul boats and materials in and out of the water. These two photographs show the interior of the boat house. The ladder, seen on the floor, originally provided access to the second floor space. It is unclear what that space was used for. The walls were lined with workbenches, some of which were removed as part of the recent clean-up effort. Again, the horizontal steel elements seem to be part of the recent stabilization effort. The round vertical posts are original. The visual presence of the main building is greatly improved by the recent repainting of the sign across the front. The windows on this corner of the main building would have illuminated the room as well as making the relationship between this structure and the garage a bit less harsh. The patio must have provided a lovely place to sit, observing the city and harbor. The concrete obviously needs some work, both around the windows and on the overhang to the right. The location is beautiful, if a bit cold at this time of year. 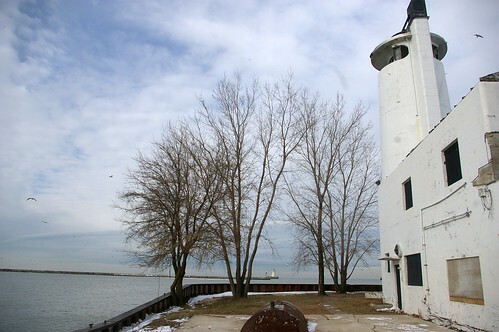 If the building is reopened, the observation tower would provide beautiful views. There are many more photos of this complex over on my Flickr account. The question comes up as to what we should do now. Restoring the buildings would likely cost $5 million plus - it seems unlikely that such funds will become available. The structures need to be stabilized. All parts of the roof must be repaired to prevent further structural damage. Exposed steel must be painted to prevent further rust. There isn't much need to protect the interior, as virtually all of the interior fabric is now gone. I'd like to see the building stabilized as a ruin. That is, in such a way as to preserve the visual character without the cost of a restoration. For instance, rebar could be fabricated to match the shapes of the old steel casement windows for those openings where the original windows have been lost. These historic buildings are part of a beautiful park, in the heart of the city. It would be a waste to not take advantage of them. It's a shame that these buildings were allowed to decay this far. We must act before buildings get to this point. How do we achieve this? We need to stop just moaning amongst ourselves and take action. We need to tell our city council members that things like this are important to us and that it is absolutely imperative that they be saved. They need to understand that we'd rather have our tax dollars spent fixing up and preserving old buildings than on convention centers and stadia. Money spent rehabbing buildings pays the salaries of local craftsmen and laborers - it stays local. Further, we, individually, need to take action. As I've said before, we have to be the ones to save these old buildings. It's only our time and labor. Our commutes are a lot shorter than many areas - why not spend some of the time we would spend commuting on repairing an old house? Don't you want to live in a neighborhood full of beautiful, interesting, historic buildings? Fenn Tower, at 2401 Euclid Avenue, in Cleveland, Ohio, is an art deco building that shows up in just about every architectural history of the city of Cleveland. While the building felt familiar, I couldn't place it on a map. On a drive by the other day, I realized that this was due to the way the area has been built up but also partially due to the orientation of the building. Seen here looking south, the tower presents a less distinguished face. From this angle, the tower looks like any other brick box. Fenn Tower faces East 24th Street, rather than Euclid Avenue, which affects its visibility. This piece of Cleveland history was built in 1930 by the National Town and Country Club as a clubhouse. It was designed by New York architects George Post & Sons. The building, 22 stories high, featured a gym, pool, dining room, as well as 120 bedrooms for the club's members. 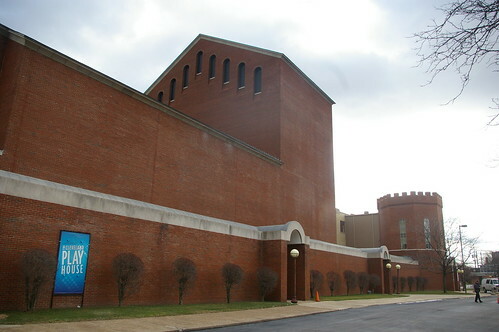 It was purchased by Fenn College, a predecessor to Cleveland State University, in 1937. The housed all of the operations of the college until it was eventually converted to the present function, as a dormitory housing 438 students. 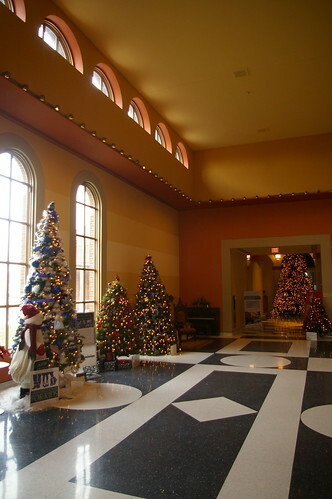 The second floor lobby features similarly impressive detail. Note the quality of work in the railing. The panel hall, on the third floor, features walls finished with dark wood, probably walnut, with intricate inlays. The entire third floor is not dark, however, as seen in this lounge. The swimming pool had a massive skylight to provide better illumination. I'm including these last two photographs because they illustrate the two rooms that we tend to spend the most money on, yet at the same time, are the least often documented and most likely to be altered as tastes change - kitchens and bathrooms. The kitchen clearly has the means to produce the number of meals required of a club of this size. This bathroom has some interesting details. Notice the lack of handles or faucets on the sinks. The handles are on the wall above the sinks. A supply line carrying the water into the sink exits through an integral faucet. I'm not sure why there appear to be four handles for each sink. All images are provided courtesy of the Cleveland State University Archives Photograph Collection in the Cleveland State University Library, which includes a couple hundred more images of Fenn Tower. 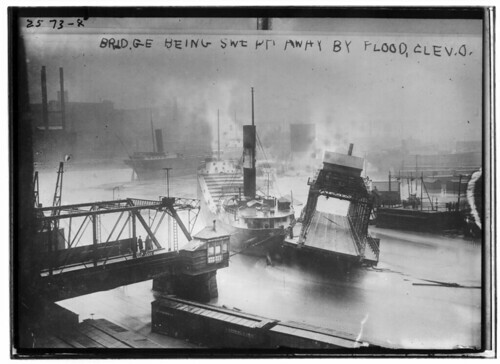 The collection is online as part of the Cleveland Memory Project. When I first heard about the damage to the 50,000 ton Mesta press at the Alcoa works in Cleveland, my reaction was minimal. It sounded like yet another attempt to retain some small bit of the once great industrial heart that made Cleveland what it is today. I had seen the Historic American Engineering Record's documentation of the press, but again, I didn't know the current significance of the it. The 50,000 ton Mesta Press has been designated a Mechanical Engineering Landmark by the American Society of Mechanical Engineers (ASME), one of about 250 sites worldwide to recieve this recognition. Their brochure for the dedication ceremony helps explain the historical significance of the press in the history of the Cleveland and the aerospace industry. The Mesta 50,000 ton hydraulic closed die forging press, this country’s largest forging machine, is currently producing the largest light metal forgings in the world. house both it and its supporting equipment. The war ended, however, before the project was fully completed. When our technical/industrial teams visited Germany after the cessation of hostilities, they found that the Germans had indeed developed and learned successfully to operate presses ranging up to 30,000 metric tons. 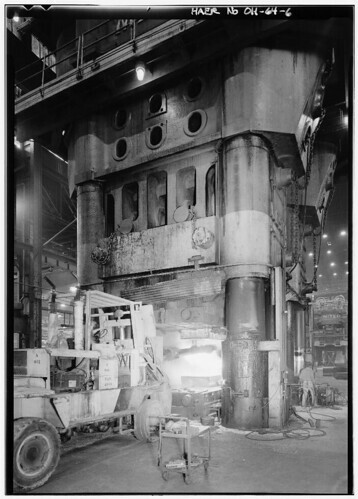 In all, three heavy die forging presses, two with a capacity of 15,000 metric tons and one with a 30,000-ton capacity, were discovered in more or less useable condition. Three extrusion presses in the 5,000 metric ton category were also located. 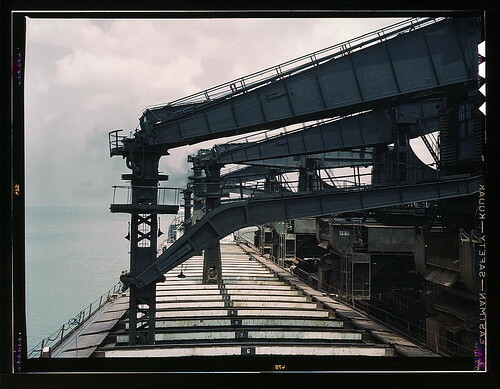 As part of the postwar settlement, the United States acquired the 15,000 and 5,000 metric ton presses which were channeled into the Air Force Heavy Press Program. The 30,000-ton press, however, was seized by the Russians. With the Soviets in possession of so large a press, our Heavy Press Program received added impetus. As of November, it seems that the press will be rebuilt. I don't see what other options ALCOA has with regard to the matter. The press has produced some of the largest single structural elements for air and spacecraft. These are parts that simply cannot be produced in any other facilities. 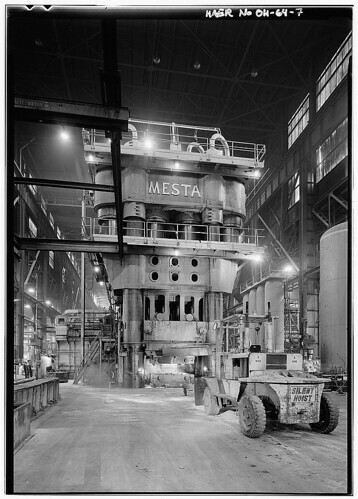 The 50,000 ton Mesta Press should be seen as a vital element in the history of industrial Cleveland, as significant as the Hulett Ore Unloaders. 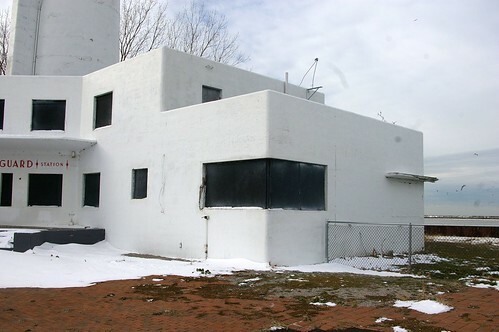 There's a new development the ongoing saga of the Langston Hughes house at 2266 East 86th Street, in Cleveland, Ohio. 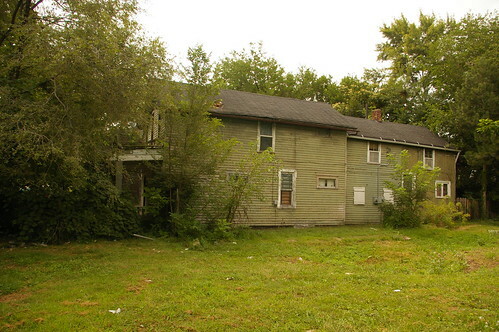 As I mentioned earlier, Fairfax Renaissance Development Corp. has purchased the house and will be rehabbing it. Amanda Rabinowitz of WKSU interviewed Jay Gardner, of Fairfax Renaissance, and myself, for a piece that aired on All Things Considered today. Here's the story. Now, onto the next big project! 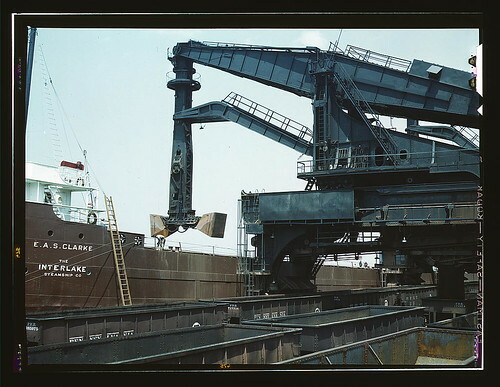 Perhaps you remember the Hulett Ore Unloaders, the massive machines designed by Clevelander George Hulett that revolutionized the process of removing ore from freighters? They sat, rusting away, on Whiskey Island until 2000, when they were demolished. The four here in Cleveland were the first four built, and the last four remaining. 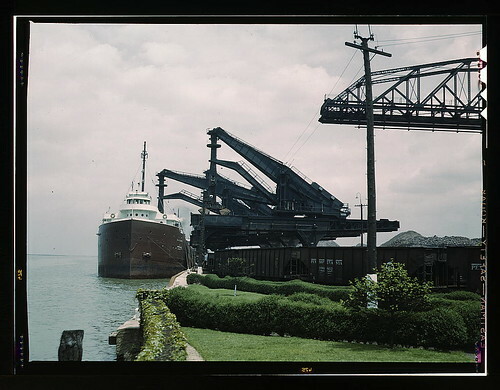 Above, we see the scoop of the Hulett open as it descends down into the freighter. 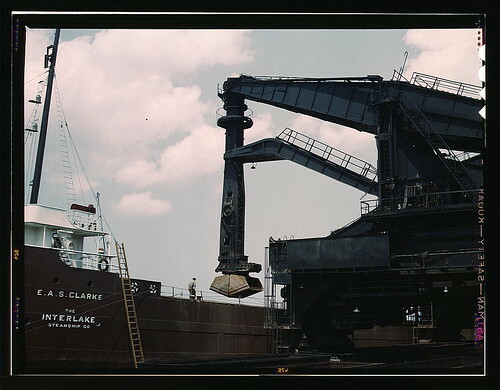 The arm of the unloader has descended all the way into the ship to scoop out the iron ore.
With the scoop full, it lifts up out of the freighter. The iron ore is then deposited and weighed. 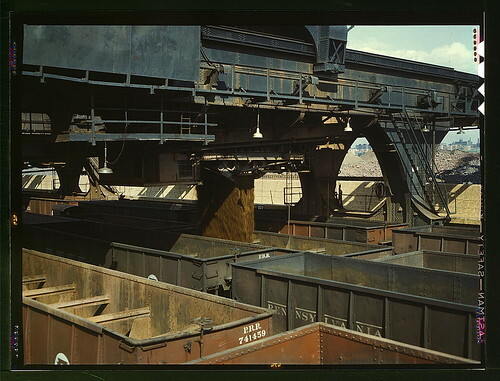 Finally, the ore is dropped into hopper cars waiting below, to go off to the steel mills. 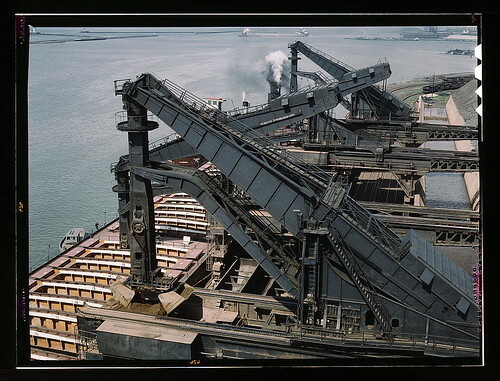 We all should have done more to prevent the demolition of these rust belt icons. 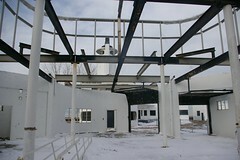 A major landmark was lost when the Huletts were dismantled. Our past is that of industry and manufacturing. We ought to embrace it. I was browsing through the American Memory collection at the Library of Congress when I came across this series of five panoramic photographs of baseball games in Cleveland. Three are from a 1915 championship game between the White Autos and the Omaha Luxus. Another shows a 1915 game between the White Autos and Johnstown, PA. Still another shows a 1914 game between Telling's Strollers and Hanna's Cleaners. The October 10, 1915 game between the White Autos and the Omaha Luxus is especially notable due to the high attendance. Click through to the higher resolution version to fully appreciate the size of the crowd. For this amateur championship game, the attendance was claimed to be 115,000, which, if correct, would make it the most attended baseball game ever. The White Autos won, 11-6. These other two images provide something of the size of the crowd. I can believe, based on these images, attendance of more than 100,000. I had never heard of this stadium, so I started looking for clues as to its location. This photo, from the 1914 amateur championship game between Telling's Strollers and Hanna's Cleaners on September 20, 1914 provides more visual clues as to the shape of the ballpark and perhaps its location. The game against Johnstown, PA, however, doesn't show us much that we haven't seen already. It seemed likely that Brookside Stadium was somewhere near the current Brookside Metropark, but where exactly was unclear. Perhaps the ballpark was in the area now used by the Cleveland Metroparks Zoo. Finally, I found the answer, in the 1922 Plat Book of the City of Cleveland. In the upper right, it shows Brookside Stadium. The stadium shown on the map didn't seem to correspond to what I could see in the photographs. I looked at Bing maps aerial photographs of the site, and much to my surprise, I saw that there was still a baseball diamond there! The topography of the space is relatively unchanged - it still has the nice "bowl" shape that makes it a perfect stadium. There are now trees growing on the hills, but other than that, the shape of the land remains much as it was in 1915. The stadium is located just south of Denison Avenue, between Fulton Road and West 46th Street. The diagonal line of people in the outfield in the first and fourth photographs is Fulton Road, from the time before it had a high-level bridge over the valley. The Omaha Luxus were an amateur team sponsored by Krug Brewery. Luxus was one of their beers. I haven't been able to learn much about the White Autos. They were presumably an amateur team sponsored by White Motor Corp. The Cleveland Blues, who became the Cleveland Naps in 1903, also used Brookside Park Stadium. Their name change came about as a result of the skill of second baseman Napoleon "Nap" Lajoie, probably the greatest player of his time, who was with the team from 1902 to 1914. I'm so happy to see that this piece of Cleveland history hasn't been lost. I knew we had one important site in baseball history in Cleveland, League Park. I didn't know we had two. Amazingly, both ballparks are places where a group of neighborhood kids can play a game of ball, on the same ground that so many great players walked. I found this little Second Empire style house at 706 Lakeview Road, in the Glenville neighborhood of Cleveland. Lakeview is one of the old roads in the area - I thought my drive might reveal some interesting historic gems. The Second Empire style was never very popular in Cleveland. When used, it is found mostly in three and four story houses. I wrote about another one, on Lexington Avenue, which I noted was small for the style, at about 2000 square feet. This one, with the addition, isn't even quite 1500 square feet. The house does not appear on the 1858 Hopkins map of Cleveland and Cuyahoga County, though the land where it sits had been subdivided at that point into a relatively small parcel. It is visible on Lake's 1874 Atlas of Cuyahoga County. I can't be sure of a date beyond this range. It's unlikely that it would have been built between 1861-1865 - little construction occurred during the Civil War. This historic home has the curious notoriety of having been the first house I've seen with aluminum siding installed on top of slate. I've seen it on wood, brick, and concrete, but slate, slate is new. Surprisingly, the slate doesn't seem to show much damage. The house is owned by one Aesha L Johnson. The address listed for her by the County Auditor, 972 Nela View, is no longer correct - she appears to have lost that house to foreclosure. She has not paid taxes on this house since 1999. Back taxes, combined with board-up and grass cutting fees, total more than $20,000. It's unlikely that anyone is willing to pay what is owed to the county at this point. The property will likely be taken for back taxes at some point in the future, though exactly when is unclear. At that point, we must be sure that this house isn't bulldozed. It's a small house, so it wouldn't be as crazy as some projects. 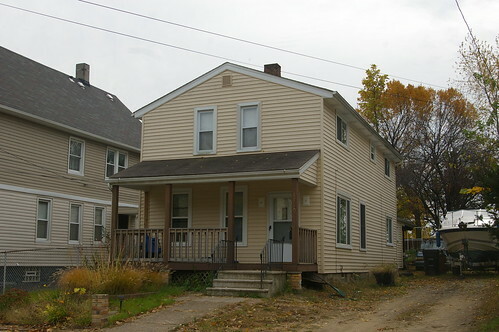 It's a good example of a style of house not common in the Cleveland area. It needs to be saved. 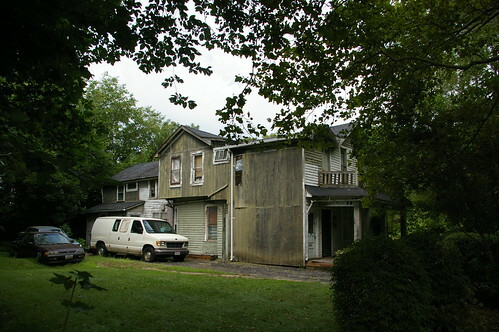 Update: As of July 21, 2010, the house had been demolished. I had a conversation recently that was quite illuminating. Jay Gardner, Community Development Director at Fairfax Renaissance Development Corporation showed me through the Langston Hughes house at 2266 East 86th Street and explained their plans for the house. The approximate cost of the renovation would be $70,000-$90,000. Gardner explained that this includes replacing the plumbing, wiring, furnace, new roof, and major work in the kitchen and bathroom. It also includes replacing the plaster with drywall, as it has significant damage in some places. He further explained that while the railing and bannister would be retained, the trim would probably be replaced with new trim milled to match the existing. They also planned to remove the vinyl siding and address the wood siding underneath it. If it needed serious work, it would be replaced with Hardie Board. At this point, I began to feel uncomfortable. With all these details were removed, what would remain of this historic house? Mr. Gardner explained that the trim and walls had to be addressed one way or another, because of lead paint issues. Further, stripping lead paint from woodwork is time and labor intensive, and therefore expensive. Fairfax Renaissance can't afford to lose huge amounts of money for the sake of historical perfection. The same arguments can be made with regard to the removal of the plaster and the replacement of the siding. Do I like this? No. Is there any other way? No. Fairfax Renaissance is trying to be historically sensitive. They're doing their best to maintain historical integrity while still keeping these houses at prices that people can afford. They're doing better than 95%+ of the people rehabbing houses in the city, and for that, I respect them. It's simply too labor intensive for anyone other than an individual to rehab a house to the standards we'd like to see upheld. If you've ever spent time stripping paint off of woodwork or doing some other detail job on an old house, you know this to be true. While commercial rehabbers should be held to a certain standard, there's just no way they can do the level of detail work that we'd like to see. There's a very big upside to this. It means that if you're willing to pour a ton of labor into one of these old houses, you can live someplace truly incredible, without a huge outlay of cash. This is especially true in the greater Cleveland area, where there are many houses with a lot of potential at bargain basement prices. We always talk about how we'd like to see this or that house saved, with the hope that someone will do it. "Someone" isn't good enough. If we can't, for whatever reason, save these houses ourselves, we need to actively work to find people who can. If there's a house on your street or in your neighborhood that deserves to be saved, talk with your neighbors and figure out a way to work with them to bring it back from the brink. We have to save these houses. No one else can afford to. 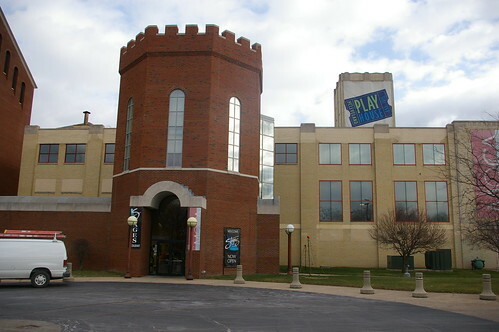 As I mentioned back in November the Cleveland Clinic has purchased the Cleveland Play House, including the spectacular building built in 1983 by Cleveland native Philip Johnson. 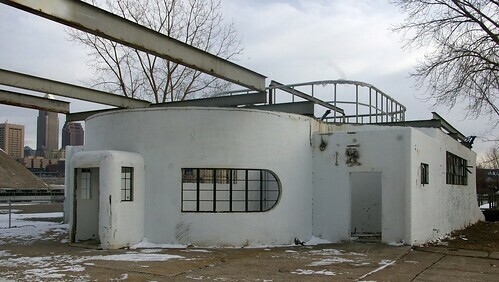 Johnson, one of the most significant architects of the 20th century, is best known for his 1949 Glass House, a National Historic Landmark, in New Canaan, Connecticut. If the Cleveland Clinic continues to behave as that have in the past, this building will be demolished. 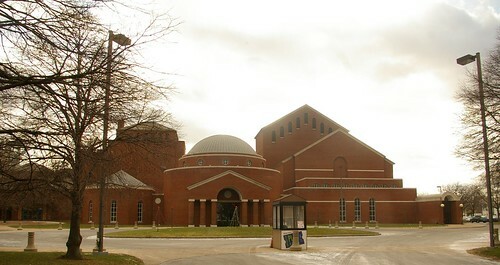 The complex is seen here from Euclid Avenue. The playful approach to the style is unique in Cleveland architecture. Johnson's addition fits well with the building currently occupied by MOCA Cleveland. The interior is truly impressive - it will not do to gut this building, just retaining the shell. We need to let the Cleveland Clinic know how we feel about this Cleveland landmark. They need to understand that it cannot simply be demolished. While I am not aware of the Clinic's exact plans for the space, I am sure that they can find a way to utilize the buildings with little modification. Two thirds of the Play House property is surface parking right now. Surely this space could be better utilized so that this landmark can be saved. 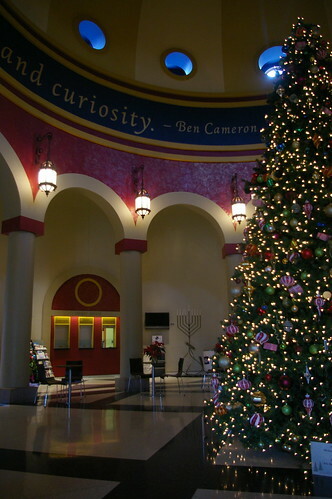 Through January 3, the Cleveland Play House is open during the day for A Festival of Trees. Take this opportunity to see the interior of this spectacular space. It is open Monday - Wednesday, 10-5, Thursday-Saturday, 10-9, and Sunday 12-5. If you want to avoid the $8 parking fee for the Play House lot, nearby street parking is available. If you’re like me, it’s tough to stay inside the driving lanes while driving through Rockefeller Park since I am usually craning my neck trying to look at the homes in the historic district of East Blvd. in Cleveland, Ohio. There’s one in particular that continues to fascinate me, and that is 1269 East 99th Street. The prominent feature of this Colonial Revival structure is the front entrance that is flanked by four towering Ionic columns. To me, it appears to be a structure that was built with much thought and effort put into it, and by someone would wanted to make an architectural statement. It appears that none of the original windows have been bricked in, however there is an addition built off the back of the structure. There is a small entrance on both sides of the building. The side entrances were most likely very conducive for the apartments that the building ended up being sectioned off into, and I speculate that the addition on the rear was most likely added for this purpose as well. On the front of the house, there seems to be a section of wooden porch railings missing on the right side. 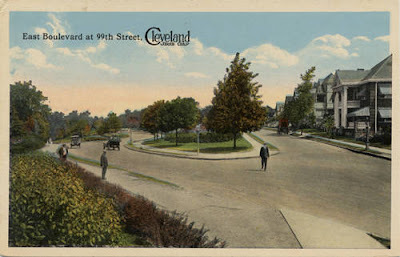 I found a postcard on the Cleveland Memory website of the intersection at East Blvd. and East 99th. I believe that the first house showing on the right hand side is the same structure. In the postcard, the columns and wooden porch railings (both lower and upper levels) are painted white and there are awnings over each window. The house does not have the same “domineering” quality that it does now. The postcard is marked 1915, and so far I have traced the house back to at least 1895, which means the house would have been at least 20 years old at the time the postcard was printed. The next time you are driving through Rockefeller Park, don’t just crane your neck, take a slight detour up the hill and along East Blvd. until it takes you back down into the park just north of St. Clair. You won’t be disappointed, and better yet, you won’t cause any traffic jams! Usually, it's easy to identify historic houses. Even when they've been seriously remodeled, they contain some details that offer clues to the history of the structure. There are some, however, where most of the obvious historic detail has been obliterated. Further, there are some houses that simply didn't have much detail to begin with. 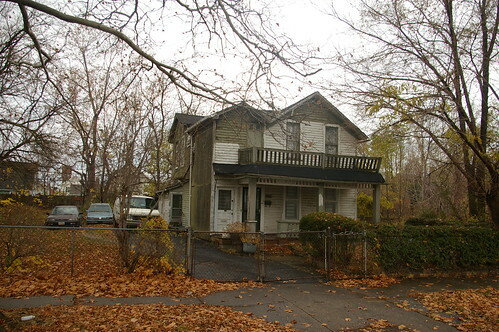 Take this historic house, at 6710 Lawnview Avenue, in the Hough neighborhood of Cleveland, Ohio as an example. It was probably built in the 1840s or 1850s. It's not on one of the older streets in the area. It's not shown on maps from the 1850s and 1870s. The exterior has been covered with vinyl siding. The windows have all been replaced, mostly with ones of a different shape from the originals. The foundation appears to have been covered with mortar, so we can't see any significant details of its construction. I drove by it a couple times without even noticing it. One small clue as to the age is the siting of the house on the lot. This house is physically farther back from the street than the other houses on the block. While this isn't always an indicator, it's something worth paying attention to, especially when all of the other houses on the street are the same distance from the road and your subject is the only outlier. It's also worth paying attention to houses that aren't sited parallel with the road. This can suggest that the house was built before the road was put through, or before it was aligned in the way it is today. A bigger clue are the proportions of the house. The pitch of the roof is consistent with what we would expect to see in a Greek Revival house. Look at the two windows on the front of the house, on the second floor. 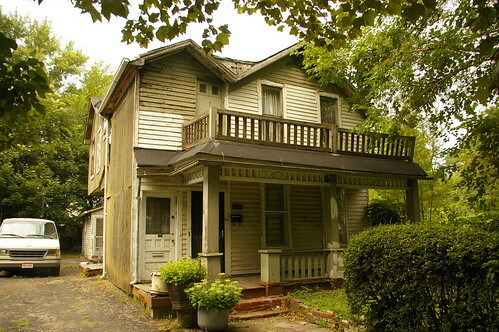 While they are replacements, the narrow openings are consistent with a house of the style, built in the 1840s or 1850s. Windows from a house built later would have been larger. Finally, look at the foundation. This doesn't help on this house and can often be misleading, because houses can be moved and put on new foundations, but it can be a valuable clue. Take this house, for instance. The hand-hewn sandstone foundation shows tool marks that you won't find on a house built in the 1860s or 1870s. How do you learn to see these details? It helps if you look at a lot of old houses, so that you can see how the details on some of them are hidden and changed. The Cleveland Restoration Society offers and excellent guide, Architectural Styles Found in Northeastern Ohio, which is quite helpful. For a more in-depth look, see Carole Rifkind's Field Guide to American Architecture. Of course, there are still some houses that, no matter how much I stare at them, I can't figure out when they were built. Styles change over time and sometimes people design things in a way that fell out of style a decade or two previous. In another post I'll share the details of a pair that have me stumped, at the corner of Lakeview Road and Auburndale Avenue. This house, at 2250 East 49th Street in Cleveland, was the residence of William Howard Brett (1846-1918), head librarian of Cleveland Public Library from 1884-1918, and proponent of the concept of open shelving of books. The concept of open shelving is especially important as, before this time, books in libraries were usually kept in closed stacks - patrons had to request the individual books that they wanted. Brett was a prominent educator in the field of library science. He was dean of the library school at Western Reserve University, and president of the American Library Association in 1896. This special issue of The Open Shelf, September-October, 1918, provides a detailed memorial of his life. Note the floral detailing on the front porch trim. It is unclear which parts of the house were built before and after Brett lived here. The house and adjacent lot are owned by 4HNB LLC, whose mailing addres is, 3277 Tullamore Rd, Cleveland Heights, OH 44118. 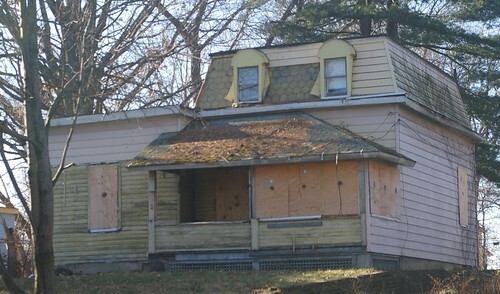 This house should not be allowed to fall into any worse condition than it is. Further, it deserves a historical marker to share the story of this prominent resident.